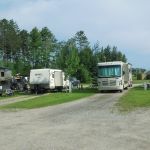 Ask fellow campers about "Fortune Bay Resort Casino RV Park" and nearby attractions. 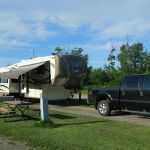 We stayed at Fortune Bay Casino Campground for a week while exploring Ely and Tower. It's about 30 miles to Ely so not very close, but there are limited choices in the area. Campground was fine. There are perimeter back-in sites with no hookups, and pull through sites with electric and water. Most of the pull through sites were very long. There was a nice community fire pit at one end. Access roads were good except checking into casino--really no great place to park while you checked in. There is a campground office, but it is only open on the weekends. The laundry is only $1/load and is very convenient. The ladies bathroom was not cleaned the entire week we were there. There were lots of mosquitoes and spiders (alive and dead) all around the sinks and in the showers. The trash I threw away on day one was still in the same trash can on day 7. I thought that was odd given the casino has a housekeeping staff. Not sure why they didn't send housekeeping down once a day to clean the bathhouse. They resurfaced the blacktop one day we were there, and it would have been nice if they could have posted a notice at the campground office so we could have anticipated and left our campsite earlier that day. They have a convenient shuttle service from the campground to the casino. There is a pool at the casino/hotel that many of the guests used. We camped at Fortune Bay Resort Casino RV Park in a Fifth Wheel. More attention could be paid to the campground. There was no attendant on site. The first night we were here the showers were filthy. They were cleaned better the 2nd day, but could still be quite a bit better. I wish they'd add sewer to sites. We camped at Fortune Bay Resort Casino RV Park in a Motorhome. Experience was overprived and demonstrated that the management had little commitment to customer experience and value. Campground sites with electric and water were sold as "full hookups" and comparable prices, yet 20 miles away we got full hook up at $22.50/ day and management was onsite seven days a week! FBC had management on site Friday to Sunday with Marina and RV Park manager stopping by once that we observed. For more than three weeks, we called to check on extension to July 6. Despite promises to get back to us, they never did. All the initiative had to be mine. Having a part time manager only available on weekend made it very difficult and again response was non-existent. If you want to gamble, have an indoor pool, then FBC is yours but if you are $ conscious go west, only 20 miles. And they have no weekly rates. We camped at Fortune Bay Resort Casino RV Park in a Motorhome. First of all it's connected to the casino, about a block away. Gravel, level pads. Water and electric only. Water hose not available at dump station, faucet out of order. Had to call front desk to get bathroom serviced. Casino and park very secluded and nestled in amongst the surrounding lakes. We camped at Fortune Bay Resort Casino RV Park in a Motorhome. Take the road trip to Ely,it's worth it. Casino food just okay. Check out the National Bear Center. Ate at the Boathouse Brewery, try the BBQ Mac salad. Lots of neat shops in Ely. Drive up to some of the lakes, the views are amazing. Golf course and Marian close by. We were looking for pull thru sites near Ely and this was the closest we could find. Some distance from Ely, but workable. Small campground with 50 amp and water, but no sewer (dump tank at park entry). Wi-Fi was available, but we used our iphone hotspot instead since it was quicker. No problem with campground, but be prepared for a drive if you're going somewhere other than the casino at Fortune Bay. 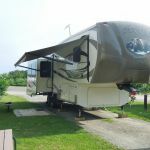 We camped at Fortune Bay Resort Casino RV Park in a Fifth Wheel. Nice casino campground but no sewer hookups. Short walk to the casino. Very weak WiFi. Verizon aircard works. Casino discount is only good if you accumulate lots of points every day. We didn't spend enough (only $100) to even come close to getting enough points for the discount. We would stay here again if in the area. We camped here in a 5th wheel toy hauler. Rate shown includes taxes. We camped at Fortune Bay Resort Casino RV Park in a Fifth Wheel. Very friendly staff. A very small designated dog walk area. The rate was $30 but if you played at the casino you were given a 40% discount on the rate. There's a beautiful challenging golf course behind the hotel/casino. We camped at Fortune Bay Resort Casino RV Park in a Motorhome. We haven't been here in about 10 years. We were able to get the last available W&E, pull-through site on Saturday night. The last review from 2007 gives a fairly good description of the park. There was a Good Sam group taking about a dozen of the 16 W&E sites. Because of the layout of the sites, sites 8 through 16 can have a problem getting the Wi-Fi because the Wi-Fi antenna on the office roof can be blocked by RVs between your site and the office. We were in site 12 and couldn't get the Wi-Fi. We moved to site 5 on Sunday morning after all the Good Sam people left and were able to get the Wi-Fi. No cable TV but the pull-through sites are satellite friendly. Within walking distance are the casino, the hotel, restaurants, a marina, and a golf course. The bathrooms are too small for a no sewers park and there is a 4 machine laundry. The fellow who takes care of the RV park was very helpful and friendly. We camped at Fortune Bay Resort Casino RV Park in a Motorhome. 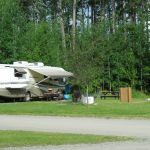 This is indeed a smaller campground, but the sixteen pull through sites with hook-ups will accommodate all lengths and widths. Although, there is only about 15 feet between sites, it’s not awning to awning with your neighbor. There is some front to back sloping on about half of the sites, but easily managed. There are also sites along the perimeter but they were designed for tents or pop-ups. Those are sloped and have no hook-ups. A picnic table is available for every site, but the campground only has a single community fire ring. The wood is free. 50A voltage was good, but there were only a few rigs here during the weekday. There is no Wi-FI. Access roads and pads are gravel, but well maintained. There is a single small bath house, but it too was well maintained. No shade trees on the pads, but temps were low so they weren’t needed. The Casino is a 5 minute walk, but there is an on-demand shuttle. It was quiet despite the closeness to the parking lot. The golf course is gorgeous, rated highly by several golf magazines, and is therefore expensive. There is a large lake nearby where boats can be rented. The single staff member was pleasant and helpful. The best description of this campground is: adequate for a few days. We camped at Fortune Bay Resort Casino RV Park in a Motorhome. We enjoyed the campground. We liked that they offered shuttle service to the dock and Resort Hotel which are both in walking distance. The golf course looked awesome. The kids loved the pool and arcade room which we were able to use since we were staying at the RV campgrounds. Lake Vermillion is a great lake. The sites with out hookups are the ones with the best location. Any site with hook ups was in the middle with no trees. I would stay here again because of the marina/dock and hotel access. My sister in-law won $140 dollars on the penny slots. It is no Vegas, but will do while your camping. We camped at Fortune Bay Resort Casino RV Park in a Travel Trailer. Small casino campground with 16 pull-thru sites with only electricity and water, surrounded by pine trees. Campground was scruffy and displayed very little maintenance taking place. Had to walk to hotel to register. Expensive considering lack of ambiance and limited amenities. Adequate for overnight stop. We camped at Fortune Bay Resort Casino RV Park in a Motorhome. Take the road trip to Ely,it's worth it. Casino food just okay. Check out the National Bear Center. Ate at the Boathouse Brewery, try the BBQ Mac salad. Lots of neat shops in Ely. Drive up to some of the lakes, the views are amazing. Golf course and Marian close by. Are you affiliated with Fortune Bay Resort Casino RV Park ?